Having spent a great deal of time in recent weeks watching and rewatching musicals made during the Second World War, I’ve come to the conclusion that For Me and My Gal might be the best of the bunch. 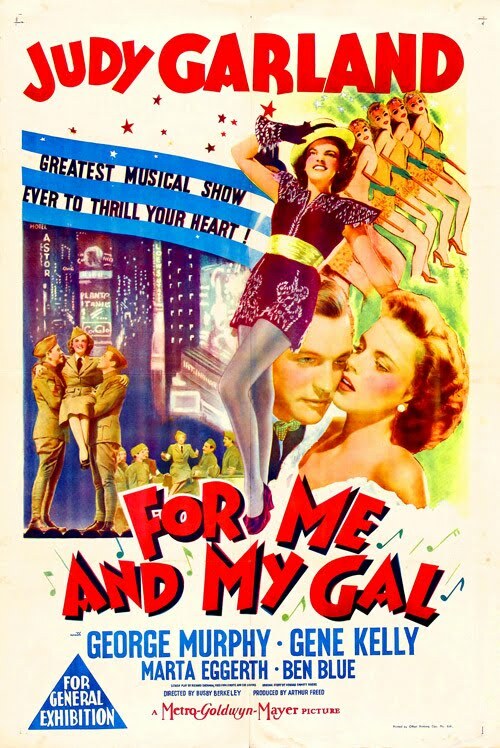 Produced by Arthur Freed and ably directed by none other than Busby Berkeley, For Me and My Gal is probably most well-known for being the screen debut of Gene Kelly. Yet Kelly’s debut aside this is still a fine wartime musical, of which charming may be the most appropriate one-word description. The film represents the first of three pairings [The Pirate (1948) and Summer Stock (1950) being the other two], of young stars Gene Kelly and Judy Garland. Kelly left Broadway at the behest of David O. Selznick to come west as a replacement for the previously cast Dan Dailey, and he never looked back. The film is also evidence that Kelly didn't have much of a learning curve either — he looks almost as polished here as he does in any of his legendary fifties roles. Yet at age twenty Judy Garland was a screen veteran. 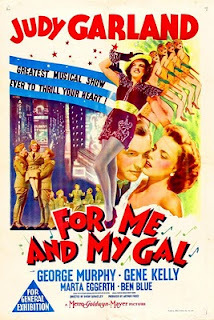 But For Me and My Gal wasn’t just another film for her, it represented her first truly grown up role, and a testing of the waters away from her usual male lead, Mickey Rooney. always somehow inexorably pulled in. There’s just something charismatic about Judy — some vulnerability — that draws you into her performances, and unlike other stars she accomplishes this magic without being overtly sexual. It’s almost as if Judy comes across as a little sister whose happiness you desperately want to ensure. She has fine romantic chemistry with Kelly, and the young couple’s numbers together are tops. I’ve seen so many films that I hold every performer’s individual role against the arc of his career, so when Garland and Kelly sing and dance the title number of For Me and My Gal in a deserted coffee shop, the effect is marvelous. On its own merits it’s a great number, but attaching the weight of the careers and the great routines that this one portends leaves one with chills. Unlike other rah-rah musicals of the War era, this one is something of a period piece: it’s set in the Great War. Gene and Judy are vaudevilleians who meet, fall in love, and set their hearts on playing the Palace on Broadway — the dream destination for those slogging and hoofing on the circuit. The dramatic tension comes after the US enters the war, and circumstances contrive for Judy to believe Gene a coward. They try to go their separate ways but are thrown together once again, this time overseas doing the USO thing (YMCA during WWI). Of course Gene’s no coward, but Judy has to learn it the hard way. The film is light on propaganda, which makes it moving moments all the more effective — and there are a few of them. By the fade out I was ready to load up on war bonds. Starring Judy Garland, Gene Kelly, and the sadly forgotten George Murphy. As far as I'm concerned it's For Me and My Gal — I've never been a fan of The Pirate, which belongs way more to Gene Kelly than it does Judy. Kelly jumps and swings around all over the MGM sound stages, which is fine, but it comes across as too much camp for me. Judy was coming apart at the seams at the time, and it shows in the movie. Judy Garland was a wonderful entertainer, but it was Deanna Durbin who obviously was the better actress, better singer, and had better looks!!! I'm with you, but I think we both might be in the minority. It's getting difficult to find people who even remember Durbin these days. Too bad her career was so short. In the long run though, she certainly fared better than Judy did. Garland has been gone for more than forty years, while Deanna is still spending her weekends shopping in Paris. I'm not sure L.B. Mayer made "a decision" to drop Deanna Durbin. 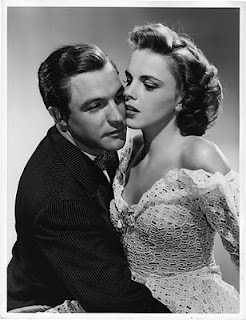 According to Gerold Frank's biography of Judy, his decision was to keep both girls only to find that the studio had inadvertently allowed Deanna's contract to lapse and Universal had signed her. Deanna was already under contract to Universal when EVERY SUNDAY was filmed. I think both girls were remarkable talents. Amazing that they came along at the same time and started out together.